The West Virginia Technology Expo is a showcase of information technology. Attendees can expect unprecedented access to industry insiders, training opportunities and the chance to network with colleagues. There will be a variety of vendors showcasing every facet of information technology; cloud computing, servers, workstations, networking, cybersecurity, data analytics, telecommunication, video conferencing and more! We will be releasing information on seminars that include strategic and tactical training from technology leaders. There's going to be something for everyone who relies on technology to get work done. All of this is made possible through the generous sponsorship of Advantage Technology. Advantage Lunch – Lunch with keynote speaker. Talk to your Advantage Technology representative if you wish to attend. Special rates are available with the following hotels. Contact the hotel directly with any inquiries or to book your rooms. For reservations call 304-345-6500, rooms reserved under: WV Technology Expo. Cutoff date June 26, 2019. The Charleston Marriott is within walking distance of the Charleston Coliseum and Convention Center. For reservations call 304-744-4641, rooms reserved under: TXP. Cutoff date July 3, 2019. The Holiday Inn & Suites is located approximately 7 miles from the Charleston Coliseum and Convention Center with shuttle services to the event. 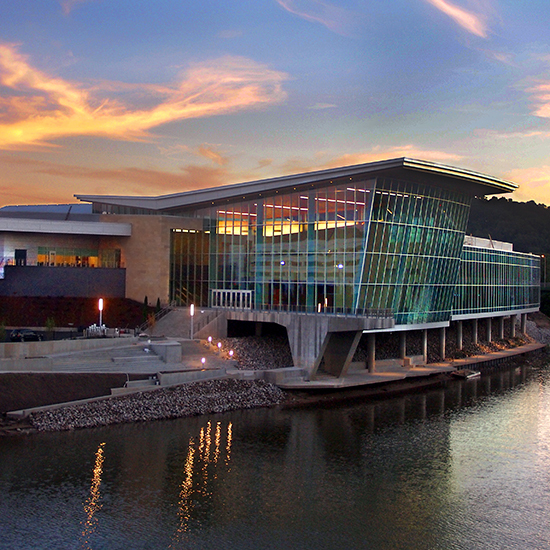 The Charleston Coliseum & Convention Center is the preeminent entertainment venue in West Virginia. The coliseum offers broad adaptability with over 13,000 seats and 30,500 square feet of event space. The attached convention center is comprised of a Grand Hall and adjoining West Halls, providing over 60,000 square feet of Class A flexible exhibition space and over 50,000 square feet of premium, unobstructed exhibit area and is utilized for exhibitions, banquets, corporate meetings, and celebrations on a grand scale. For over 15 years Advantage Technology has been providing IT services and solutions. With offices in Charleston, Shepherdstown, and Morgantown, WV, as well Williamsport, MD, and Lexington, KY, Advantage Technology services companies in West Virginia, Maryland, Kentucky, Virginia, Pennsylvania and throughout the Mid-Atlantic region along with clients in Florida, Alabama, Tennessee, Ohio, and Canada. Because Advantage Technology has over 80 technicians, they can specialize in emerging areas of information technology and have dedicated resources to specific disciplines, rather than merely being computer generalists. Their focus and innovation enable them to support over 800 companies and continue to expand into cutting edge areas of information technology.